In this lesson and the following few lessons, you will get to learn the Japanese conditional form, which is considered to be one of the most difficult topic in Japanese language. In English, you can normally use the pair of words "if~ then~" for almost all conditional sentences - "If something happens, then something happens". However, in Japanese you need to change to different conditional forms depending on the situation. These Japanese conditional forms include と (to), ても (temo), ば (ba), なら (nara) and たら (tara) sentences. They are all different, though they all translate to "if" in English. In order to understand how to use all of them, the most important thing is to remember which conditional form to use during each specific situation. In this way, you won't be confused about using the wrong conditional form. Note 1: For と sentence, sentence structure is always in present tense. That means Sentence 1 and Sentence 2 are always in present tense, no past tense. Note 2: For negative な-Adj and Noun sentence, use でない (denai) instead of ではない (dewanai). In the above sentence patterns, the left hand sides are the conditions, the right hand sides are what happen next when the conditions are fulfilled. Meaning: If you turn on the light, it will become brighter. Meaning: If Spring comes, the cherry blossom will bloom. Meaning: If you add 3 to 2, it will become 5. Meaning: If the weather is hot, you will get thirsty. Meaning: If it's quiet, you can sleep well. Meaning: If you are above 20 years old, you can drink alcohol in Japan. Meaning: If you don't turn on the light in the night, it's dark here. Meaning: If there is no snow, you cannot ski. Meaning: If you don't eat anything, you will become thin. Meaning: If you're not tall, you cannot become a model. Meaning: If it's not quiet, you cannot sleep well. Meaning: If the weather is not good, you cannot see the mountain far away. と (to) sentence expresses Sentence 2 inevitably as a result of Sentence 1. It means whenever the condition in Sentence 1 is set, result in Sentence 2 will always happen. Therefore expressions used in Sentence 2 are natural and predictable events/states or unavoidable facts. Note: Expressions of one's will, hope, judgement, permission, order, invitation or request, etc cannot be used in Sentence 2. ...it's a nature-related fact we know that "If Spring comes, the cherry blossom will bloom". The cherry blossom will not bloom in Summer, Autumn and Winter. Meaning: If my grandfather does not wear glasses, he can't read the newspaper. When you use the train ticketing machine, if you press the button of the 200 yen ticket after inserting the money, the 200 yen ticket will be dispensed. The 180 yen ticket or 220 yen ticket will not be dispensed if you press the 200 yen ticket's button. You can use Japanese conditional form と sentence for this kind of situation (using of machine). Meaning: If you press this button, 200 yen ticket will come out. Meaning: If you turn this knob, volume will go up. Meaning: If you go straight, you will find the hospital on the right. Meaning: If you turn left at that crossroad, you will find the post office. It's stated that expressions of one's will, hope, judgement, permission, order, invitation or request, etc cannot be used in Sentence 2 of Japanese conditional form と Sentence. If you say 春になると、日本へ行きます。 (haru ni naru to, nihon e ikimasu), it means "If Spring comes, I will go to Japan". The second sentence here is a personal will, which cannot be used in the Japanese conditional form と sentence according to the rules. Therefore this sentence is incorrect in Japanese context. This is a common mistake. Probably the speaker wants to say "When Spring comes, I am going to Japan". It sounds perfect for English. But remember that for と sentence, whenever condition in Sentence 1 is set, the result in Sentence 2 will always happen. In this example, "going to Japan" is a one-time event. It doesn't happen for every Spring. Therefore と sentence cannot be used in this situation. 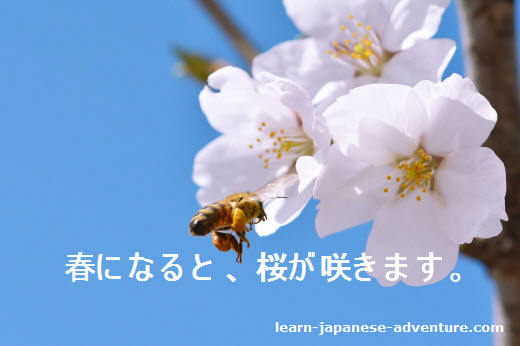 However, if the event of "going to Japan" is a habitual action, that means you go to Japan every year (without fail) when Spring comes, then you can use と sentence. You have to put 毎年 (maitoshi) which means every year to make the action habitual. Meaning: Every year when Spring comes, I go to Japan. In the next few intermediate lessons, the rest of the Japanese conditional forms will be discussed. Lesson 28: たら (tara) Sentence Special Case.